Hertz Herson CPA LLP (Hertz Herson), headquartered in New York, N.Y., has joined CPAmerica International, an accounting association of independent, certified public accounting firms that provides shared best practices, networking opportunities and access to expert resources for member firms. We share a common set of values and a commitment to excellence, performance and service that will help drive the future of the industry and the growth of CPAmerica and our individual firms. Hertz Herson CPA LLP(Hertz Herson), headquartered in New York, N.Y., has joined CPAmerica International, an accounting association of independent, certified public accounting firms that provides shared best practices, networking opportunities and access to expert resources for member firms. 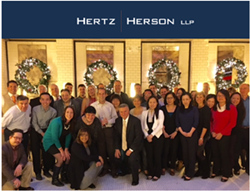 Hertz Herson, a top 35 accounting firm in the New York City metro area and a Top 250 firm across the country, has been proudly serving entrepreneurial businesses in the greater New York area since 1931. As an exclusive association of independent CPA firms, CPAmerica provides opportunities for its members to continuously improve. CPAmerica is a member of Crowe Horwath International, which has members in more than 750 offices in more than 130 countries around the world. 2018 marks the 40th anniversary of CPAmerica International, an accounting association made up of independent certified public accounting firms that is built on four key goals: to continuously improve; to make more money; to strengthen relationships among member firms; and to bring prestige to firms both domestically and internationally. As a member of the eighth largest global accounting network Crowe Horwath International, CPAmerica expands to more than 200 independent accounting and advisory services firms in more than 130 countries, and has a combined firm revenue of $3.7 billion. Learn more about CPAmerica at http://www.cpamerica.org.